This was an extremely pleasing install. The result is almost identical. 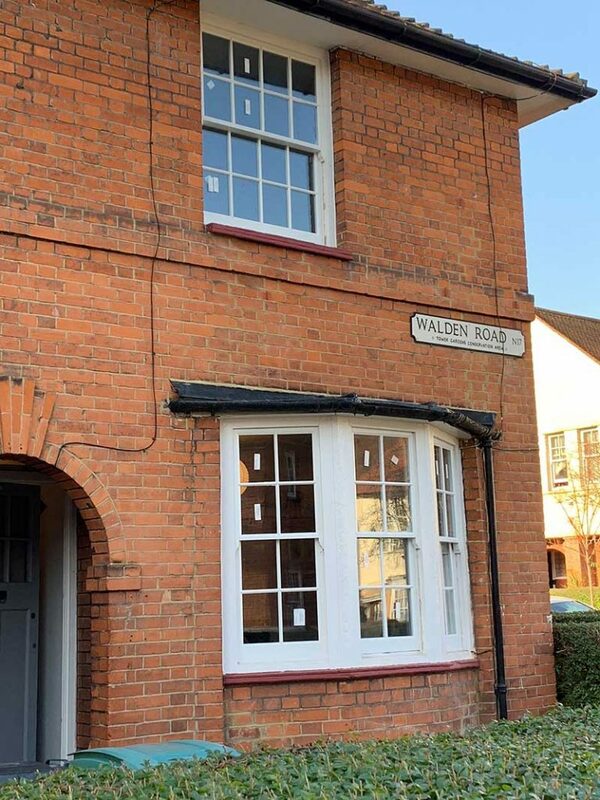 This install of double glazed sash windows into the original frame in North London was particular gratifying because the match for the original windows took considerable effort to make like for like and appear as single glazed windows although actually being high quality double glazed sash windows made from hardwood with a factory spray finish, much like the install in Hammersmith & Chiswick earlier this year. 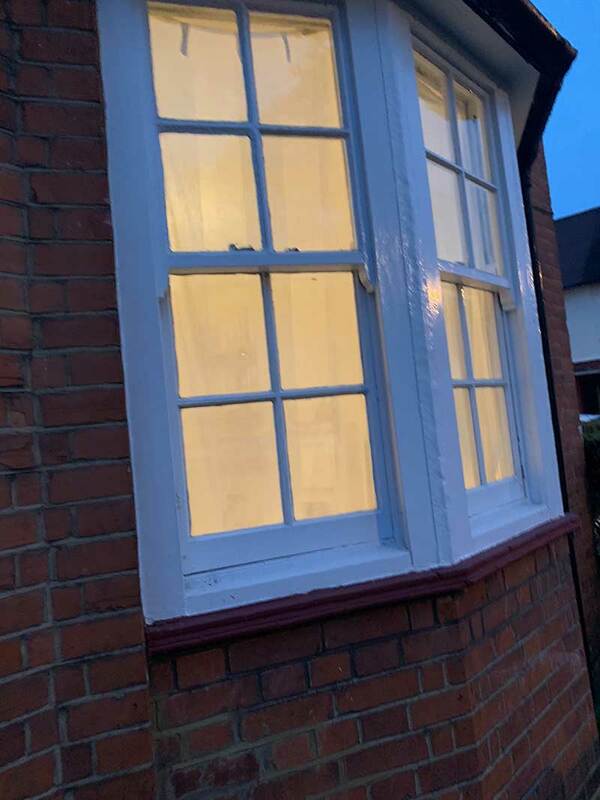 When windows have this much glazing bar there are many factors that go towards double glazed sash windows re-using the existing box frame that look identical from roadside. To ensure the double glazed sash windows are a like for like match we follow set procedures that ensure quality every time. If you take a look at the before and after pictures on this install you can tell almost no difference at all, in fact, they are not even recognisable was double glazed windows and they also contain a draught proofing system. As you can see this is quite an attractive window and considerable accuracy is required to keeping this looking as is. This was an extremely pleasing install. The result is almost identical. The lower rails are giving an impression of being larger because they are sealed across the bottom. If you look at the middle sash you can see they are considerably smaller. As you can see our double glazed sash windows have all the hallmarks of slender single glazed sash windows. We attempt to keep the look of the property absolutely unchanged and not detract from the original windows. 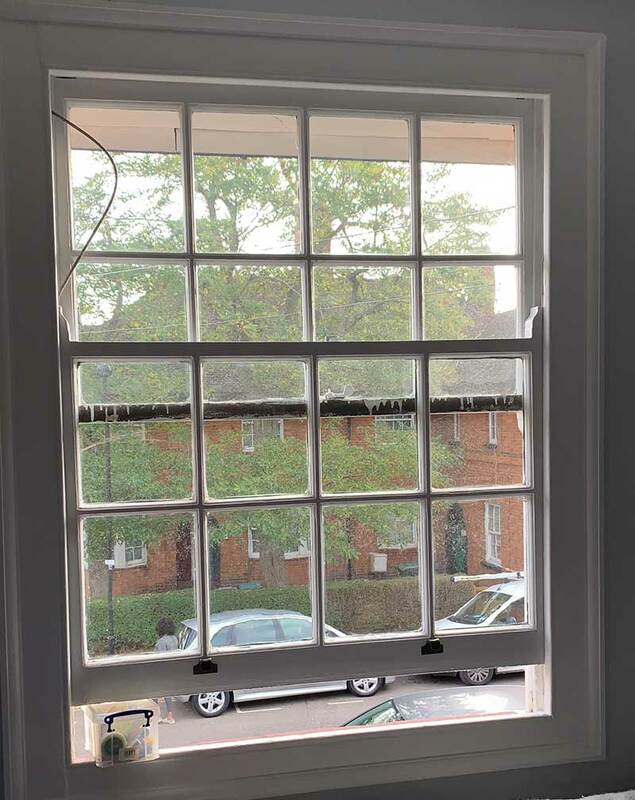 Whilst being one of my favourite installs in North London this year and particularly gratifying, I was also a little disappointed we couldn’t use the original sash windows. The problem is, with this much glazing bar we cannot economically double glaze these sash windows price wise. The thickness of the glazing bar on double glazed sash windows. It’s important when looking at sash window double glazing that the glazing bar is measured accurately. Normally glazing bar is 22mm or close to this but can actually range from 18mm all the way to 30mm. Manufacturing a few millimetres different doesn’t sound all that important but you must also factor for the double glazed unit as well. When looking at glazing bar side on it gives an impression of being wider. This means it’s always safer to err on the side of caution and slightly under measure if anything. Typically we manufacture double glazed sash windows with a 53 mm stile. 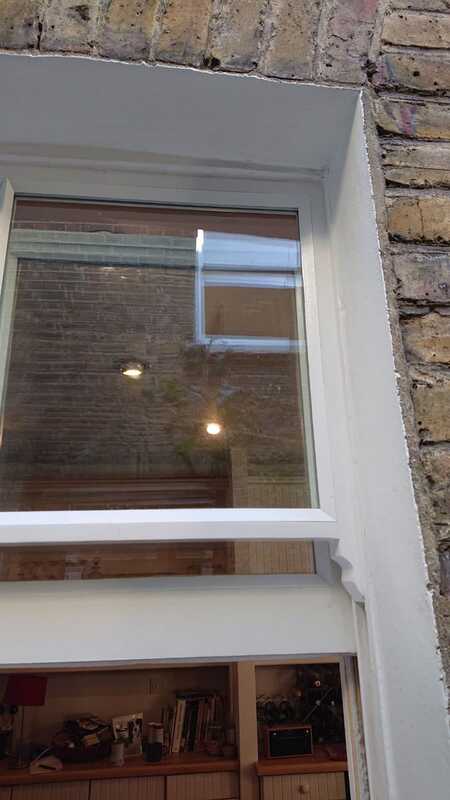 Typically single glazed sash windows are 44mm but there’s an issue replicating this depth. The horn profile of the sash ends up too small from being cut with the rebate of the stile that holds the double glazed unit. Also, a slightly deeper stile affords extra strength and timber which is good for the security restrictors making them far more secure in the timber and far less vulnerable to break in. Close up look at glazing bead use rather than putty on double glazed sash windows. Unlike putty which is prone to issues of finger marks on installation glazing bead is not affected by knocks or touches that come from any sensible installation. Also notice how the bead covers the unit beautifully. From any distance at all and straight on you would have no idea this window is double glazed except the reflection of the glass created by two panes making it look vibrant and shiny, which looks very nice in itself. To keep our double glazed sash windows looking as original as possible there needs to be a trade between depth of double glazed unit for aesthetics and functionality. The thickness of the best looking sash windows are 10mm slimline double glazed sash windows mainly used in listed building sash window repair. The problem with this depth is they simply aren’t efficient enough. Heat is fine, but noise isn’t significantly reduced because there’s not enough of an air gap between the panes of glass. Equally a 28mm 4-20-4 unit would be unsightly in an original sash window install. Some London Sash Window Companies (so definitely know exactly what you want and use the right company) do in fact use this depth for performance on entire new window replacement, it’s our preference to install new sash windows with 20mm Argon filled units although sound proofing isn’t quite as good. However when making double glazed like for like sash windows in the original frame the best of both worlds is a 16mm 4-8-4 soft coat low-E unit. This is where it really pays to know your sash window glass types. The first process of this install was to measure and check that the original looking double glazed windows we manufactured would fit, which they did, perfectly. We then begin the process of dust sheeting and remove the original sash windows. This is a simple case of removing the staff bead which holds the lower sash in place. Then cutting the cords to the lower sash we carefully lift it from the opening. Following this the middle parting bead trim is removed and top sash removed in exactly the same way as the lower sash. This gives full access to the frame. Single glazed sash window before replacement; the after is the second image above that shows the bay as well. With the frame open we can now scrape back any loose paint or unwanted debris to allow for a better fit go the sash. It makes no sense to install sash and machine them rather than remove this debris. The sashes are then offered in and machined to fit the existing frame. This is an opportunity to level the meeting rails as best as is possible. With the sashes ready to install we then correctly counterbalanced the weights so that when sash is attached it will pull nicely to the top of the frame. The sash windows are then rebuilt and attached with new trims. We install furniture and security restrictors to secure the windows and then clean down the glass. We touch up any paint chips and then leave the frames needing a little light sanding, filling and painting. If you would like to know more about this service then please take a look at our comprehensive double glazed sash windows page or call us today.